Home » Bamboo Baby Washcloths for your Face? What?, you may ask. Yes, you heard correctly, Bamboo Baby Washcloths for your Face! 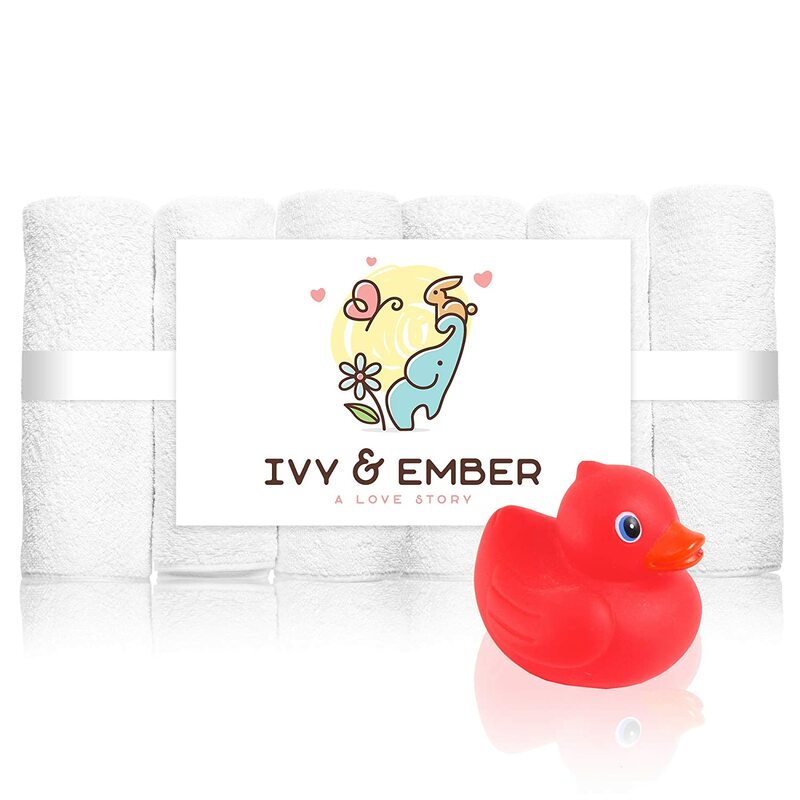 Ivy & Ember made by Trusted by Mothers are silky soft 100% organic bamboo washcloths that are not only for newborns! According to their listing, these washcloths will do wonders for both your hands & face. SILKY SOFTNESS – Because our product is made of eco-friendly bamboo fiber it’s the softest material you’ll find for newborn skin. It’s naturally antibacterial and hypoallergenic. We keep our towels free of toxins, chemicals, or dyes, which is why it’s the ultimate safe way to wash your kids in the bathtub. This also makes it perfect for the face and body as well, or those with sensitive skin, eczema, acne, psoriasis, or even bathing the elderly. UNMATCHED DURABILITY – The problem with other bamboo hand clothes is they are paper thin because they only use 1 layer with very little thickness which causes them to snag so easy, get holes, and then are torn apart after the very first wash. OUR PRODUCT SOLVES THIS PROBLEM! Why? It’s because our 6 pack collection each have 2 layers of 500 gsm thickness. As a bonus for even longer usage, we’ve also included a free delicates wash bag for you. BEST NEW PARENTS GIFT – If you’ve been looking for the perfect gift for an expectant mom, then your search is over! These bathing accessories and items are on the list of essentials for infant girls or boys. Our set of premium handtowels are found in most registries by name. LARGEST SIZE – We’ve also found that the other main complaint with other washcloths is that they are not large enough. PROBLEM SOLVED! We made sure to make each cloth 10 x 10 inches so that they are able to be used with infants, toddlers, and for adults as face cloths. Another GREAT TIP is to keep some in the diaper bag or travel kit because they can easily be reused as burp cloths or wipes to reduce rashes on your precious little ones. SATISFACTION GUARANTEED – Does this come with a money back guarantee? YES! Your purchase comes with a full 90-day no-risk, no-nonsense 100% MONEY BACK GUARANTEE. Either you’re thrilled, or we don’t want your money! See why Amazon customers rate our bamboo baby washcloths 5-Stars! QUESTION: Are your washcloths made of 100% organic bamboo fiber? ANSWER: Absolutely YES! We source only the most organic eco-friendly bamboo and make super soft and durable 2 layer washcloths that will last. QUESTION: Will your towel set fall apart after the first wash like other brands? ANSWER: NO! Our 6 pack set of washcloths will last a long time because we made sure to make them 2 layers of 500gsm thick bamboo fiber. Plus we’ve also included a free delicates wash bag to wash them in for even more protection. That’s why our baby washcloths collection is the #1 choice for Amazon buyers! QUESTION: Does your bamboo washcloths come with wash instructions? ANSWER: Yes, they do! On each cloth there is a tag with our logo on one side and the wash instructions. QUESTION: Our your super soft 100% organic bamboo washcloths only for babies? ANSWER: Of course not! We made sure to make them a size that is common for face wash cloths as well, so they are great to use for sensitive skin or for older adults as well. They are 10 x 10 inches each. So you will have no problem using them from newborns to adults. ANSWER: Absolutely yes! You risk absolutely nothing. Our washcloths are backed by an unconditional 100% no-risk, no-nonsense money back guarantee. Your search for “the ONE” perfect new mothers gift is finally over! So let us know how it went for you with these washcloths!